More than 10 self-propelled artillery system (ACS) "Hyacinth-S" joined the fleet artillery weapons-arms combining Eastern Military District (OIE), deployed in the Amur region. In the near future are expected to arrive more than 20 units, the press service of the Military District. 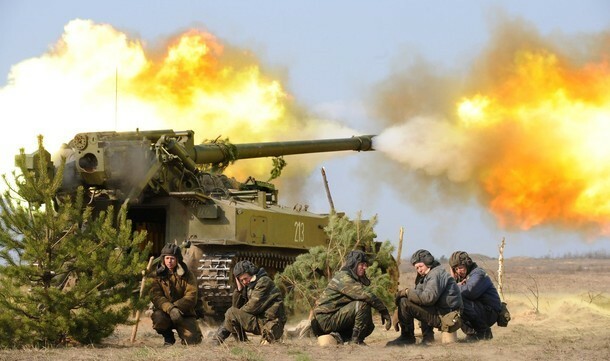 152-mm self-propelled guns, "Hyacinth-S" — long-range weapon capable of striking targets at a distance up to 33 km. ACS "Hyacinth-S" on the crawler has a light armor protection, highly maneuverable and powerful weapons can to fire, as from the closed position and the open sights. Cannon mounted on a unique muzzle brake, which absorbs more than 50% of the energy efficiency in the delivery of fire. ACS "Hyacinth-S" is designed to engage the open and covered manpower, weapons and military equipment of the enemy. Series production began in 1976. Self-propelled gun carried by reckless scheme. Welded armored body and bulletproof provides ballistic protection of the crew and internal equipment. On the body hung bulldozer equipment for entrenchment and hinged base plate. Power plant — a multi-fuel diesel engine with water cooling.